This is really more about Alan Scott being compared to Swamp Thing than you’ve ever wanted to read. And if you recall your Swamp Thing comics of about, oh, 23 years ago, “The Grey” was an alien fungus-type thingie that Swamp Thing fought against, and you can read more about that on this page. I don’t believe there’s any connection between the Grey in Earth 2 and Swampy’s Grey, but there could very well be a minor connection between the expressions of the Green on both Earth 2 and, um, whatever Earth is the current version of Earth we’re dealing with in our post-Flashpoint DC universe. …I’m just going to assume y’all know what I’m talking about when I write all this stuff, because frankly, looking at it as I write it makes me feel like a crazy person. Anyway, minor connection between the two, right. Well, we’re still dealing with “The Green” and I’m sure no one writing comics, particularly not James Robinson, is unaware of that particular nomenclature being used by Alan Moore to describe Earth’s life force during his Swamp Thing run. So I guess it’s simply an alternate take on the same sort of thing Moore was getting at, down to the Green choosing a champion to fight on its behalf when necessary. 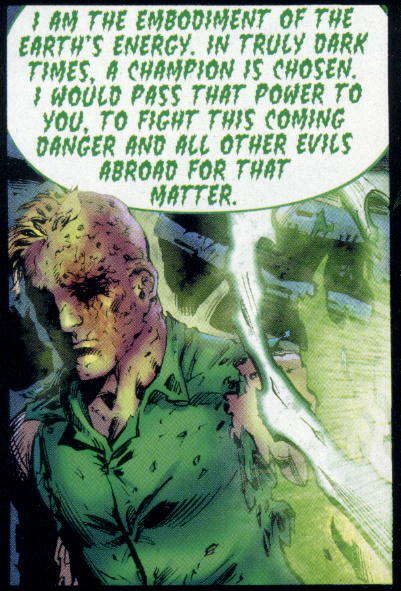 The question isn’t answered, but one possible interpretation is that whoever was speaking on behalf of the Green there was in fact a previous champion of the Green, who chose his successor in Alan Scott…who may someday also be absorbed into this life force of the planet, until he too reemerges to chose his own successor. It’s kinda sorta similar to previous Swamp Things retiring to the Parliament of Trees, where they guide the Green from sort of behind the scenes, while a more active champion is their avatar in the world. Again, I’m sounding like a crazy person. I’m just trying to describe the comics, I swear. Anyway, yeah, Rich, there are some interesting parallels between what’s going on with Alan Scott in Earth 2 and the saga of the Swamp Thing. I don’t think the twain shall ever meet, but I do think Robinson is writing a knowing reinterpretation of what Moore had put down. Speaking of Swamp Thing, Swamp Mark popped in with some swampy news in yesterday’s comments, noting that in addition to the coming Animal Man crossover, Frankenstein: Agent of S.H.A.D.E. will be part of the fun for issues #13-#15. And that there will be a small tie-in with Ravagers #5. So, thanks, Swamp Mark, for letting us know. I realize that, as Swamp Thing’s Best Friend, I probably should be a little more on top of reporting what’s going on in Swamp Thing’s world, especially since we now have an ongoing Swamp Thing series again and I shouldn’t just take it for granted. But, you know, I get distracted easily and sometimes I forget. So you all keep nagging me about keeping up with Swamp Thing news…sure, I might grumble a little, but I know it’s only because you folks care. I hope. Also, as for my being crazy…at least my pal Tim doesn’t think I am. “Probably sane” is very likely the nicest thing I’ll hear about myself this week. Or month. Or…well, I’d better stop there. See,this is what I’m talking about.Thanks to you,Mike,I get to add the Earth 2 stuff to my buying list.By just reading the solicitation from DC,there’s no way to tell it relates to Swampy’s world.That issue #0 looks especially interesting.If it’s Grundy’s origin there should be a Swampy appearance.Man,is this fun!I can’t remember a time when Swampy was this mainstream.Now if only Mr. Handley would get on board,I could retire to the Parliament a happy fan. Only if you flood his mailbox with endless requests and comments about nothing but ***SWAMP THING***. Until then, he’s vanished into the Facebook/Twitter/MySpace-land of PAYING GIGS and online advertising with dollar signs $$$$$ in his eyes, never to return…. It just seems weird to me to always have to go to a site that says “progressiveruin” instead of “swampthing” to find any Swamp Thing news and commentary and then have to dig for it. I’d rather go to a website that’s 100% Swampy ALL THE TIME. Maybe Alan Scott is Alec Holland’s Earth-2 counterpart. Thanks, Mike. I was curious what you’d think of this, as it strikes me as a pretty obvious recasting of the Moore Swamp Thing mythology into a different setting. I guess it’s a little more “epic” than finding a magic lantern. Mike Sterling…probably sane since 1969. If someone’s pointing a gun at you and forcing you to come to my website, winky-emoticon TWICE. I haven’t read it since it came out, so I’m just guessing based on a half-memory here, but wasn’t that similar to the origin of the Green Lantern in “Just Imagine Stan Lee and Dave Gibbons Creating Green Lantern (No This Title Isn’t Too Long, Why Do You Ask?)”…? I think you may be seeing malice and/or entitlement where none was intended.